Fury Things and Brilliant Beast will be releasing their first ever split EP Wednesday night at the Turf Club. Fury Things are a trio from Minneapolis made up of guitarist/vocalist Kyle Werstein, bassist Devon Bryant, and drummer Andrew Carson. Werstein writes compelling lyrics and shreds fuzzy guitar solos while sharing the melody with Bryant's bass. Carson slams on cymbals higher than his head and has broken too many drumsticks to count. Together they're making fast, loud rock music reminiscent of Superchunk, Dinosaur Jr, and Hüsker Dü. Brilliant Beast is a loud band from Minneapolis. Playing in their current formation since 2011, Brilliant Beast released their third album, Where Do You Want, in November 2013. Led by sibling dual-vocalists Hannah (vocals, guitar, violin) and Jordan Porter (vocals, guitar) and anchored by the breakneck rhythm section of Mark Kartarik (bass) and Eric Whalen (drums). Wednesday night's Split EP release party will reveal the latest accomplishments of both of these home-grown rock bands. Since the experimental space-rock trio The Life and Times formed in Chicago and began disarming audiences with unbelievably loud yet relentlessly beautiful music, the main constant for the band has been how un-categorizable they've remained. Lead singer Allen Epley, drummer Chris Metcalf and bassist Eric Abert were the calling card of Suburban Hymns (DeSoto) and each subsequent release. 2012's No One Loves You Like I Do was a towering think rock follow-up to their critically acclaimed breakthrough Tragic Boogie, pushing and molding the band's kitchen-sink aesthetic and beautifully lush, over-the-top arrangements into a tight, dense collection of songs with much more immediacy, urgency, and directness. The Life and Times band released their latest album, Lost Bees, in August 2014. Cheap drinks and CHEAP GIRLS will be filling the Turf Club on Friday. This band will be holding a special night for advance ticket-holders, but I'll let them tell you in their own words. "We're incredibly excited about these shows coming up in your area, and we firmly believe that the artists coming along with us are some of the most important making music right now (RESTORATIONS, CHRIS FARREN, and THE SLOW DEATH). As a reward to those who show up early to see the entire show, we are rewarding the first 20 advance ticket-holders in attendance a free, exclusive hand-screened tour poster as a THANK YOU for supporting the music of our friends and of ourselves. The poster will not be for sale in any other form. On top of all that, anyone with an advance ticket can take 5 bucks off of any purchase made at the Cheap Girls merch table. Thanks for being a part of this with us." Hurry down to the Turf Club Friday to claim the merch. Doors will open early, so start your weekend off right. 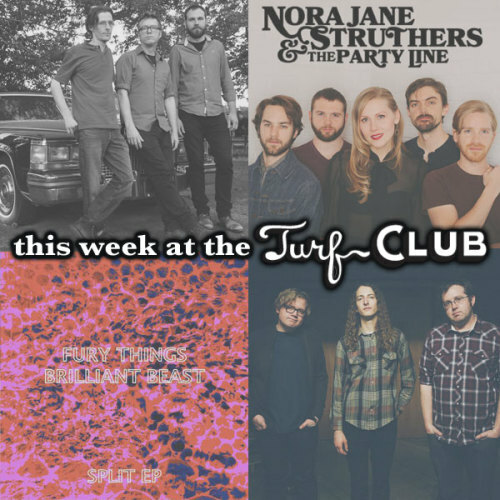 Saturday will play host to a great night in St. Paul as Nora Jane Struthers & The Party Line take over the Turf Club. The night will feature their new album, Wake. The evocative one-word title speaks volumes about what's happening on Nora Jane Struthers' latest album. For the thirty-year old singer-songwriter, it's "wake" in several senses of the word. There's the trail of a life and career behind her, the slipstream of lessons learned. There's the quiet observance and letting go of who she has been up until now as both an artist and a person. And most of all, there's the stirring of something new, an opening of a door and wide-eyed rush forward into a place of discovery and dizzying possibilities. "The whole album is about strength through vulnerability," she says. "That's what I've come to as an artist, and a human being, and I think it's the most powerful force in my life. I feel so much more like my childhood self now than I did over the past five years, than I have in my whole adult life." We're certainly excited to see what these passionate musicians have in store for us Saturday night as they debut Wake. "Dewi Sant seems like the kind of guy that gets talked about well." You'd like to think that his goodness and sweetness both precedes and post-cedes him. The deeds of romance and love that he submitted as offerings have been duly noted and they will be played back for him when he gets to the pearly gates, as if to give him an opportunity to take a bow or to receive something like a good guy standing ovation. For The Person & The People, everything traces back to the high school years. A group of old friends from multiple bands in the area finally teamed up and joined together to make music. The result of that is a power-pop flavored rock and roll band that truly stands out from the rest. That youthful energy can certainly still be felt with this band. Lastly, formed in two cities founded on the intrinsic turns and tails of one of Earth's longest waterways, Fair Oaks has made an album that aims to shine a solar-hued spotlight on nature in the urban environment. Then Came the Morning, the second album by the Southern-born, Brooklyn-based indie-folk trio the Lone Bellow, opens with a crest of churchly piano, a patter of drums, and a fanfare of voices harmonizing like a sunrise. It's a powerful introduction, enormous and overwhelming, as Zach Williams, Brian Elmquist, and Kanene Pipkin testify mightily to life's great struggles and joys, heralding the morning that dispels the dark night: "Then came the morning! It was bright, like the light that you kept from your smile!" Working with producer Aaron Dessner of the National, the Lone Bellow has created a sound that mixes folk sincerity, gospel fervor, even heavy metal thunder, but the heart of the band is harmony: three voices united in a lone bellow. "The feeling I get singing with Zach and Brian is completely natural and wholly electrifying," says Kanene. "Our voices feel like they were made to sing together."